Very topical post on Tallbloke. We’ve got the low solar activity, the easterly QBO and negative AO, but still waiting for the NAO to swing deeply negative. 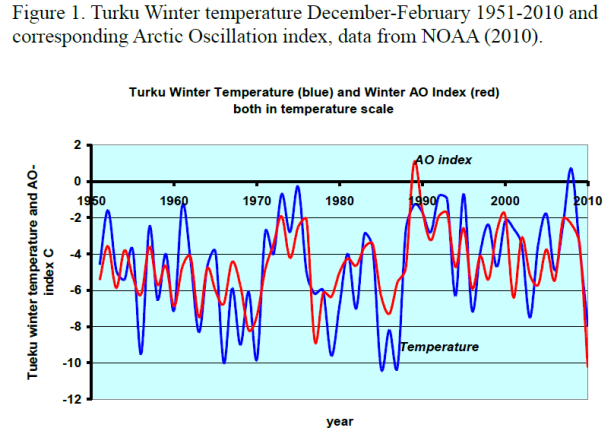 Future low solar activity periods may cause cold winters in North America, Europe and Russia. Historically, low solar activity periods like the Dalton and Maunder Minima have been connected to cold winters in Europe. It seems very possible that the low solar activity forced areas of low pressures into a southern route or caused a negative Arctic Oscillation, AO, which in turn allowed cold air from the North Pole to flow across Europe. But can we obtain from real measurements that low solar activity really is able to do that?